I did not think that there would be a demand for a cruising version of the Didi Mini Mk3 but I was very quickly proven wrong. Over the past year a few people have asked when this variation would be available, so here it is. 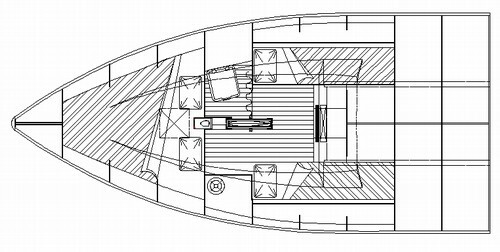 Like the Didi Cruise-Mini, this design offers shallow water, comfort and easier handling options on the racing hull. Construction is the same as for the standard Didi Mini Mk3, with some cruiser-oriented modifications. First, we have transplanted the lifting keel of the Didi 26 trailer sailer into the hull. This keel has a glass covered hardwood foil and lead beavertail ballast bulb for efficiency. It is lifted with a tackle inside the box and a winch on the cabintop. The keel casing fits neatly between the two parts of the plywood double backbone in the saloon and stiffens the hull by tying the hull and deck together. We have used the keel casing as a division to introduce an enclosed heads compartment just aft of the mast. This can be fitted with a Porta-Potti or a small marine toilet. A simplified version of the Didi Mini Mk3 fixed keel is also included in the design package, for those who don't want the lifting keel feature and the limitations that it imposes on the interior of the boat. Those who do not want the enclosed heads can build the standard Didi Mini Mk3 saloon or build a navigation station in this area. Forward of the mast, the whole forecabin is turned into a large double berth, comfortable when at anchor. In the saloon, the settees double as quarter berths for sleeping at sea. We have added a box step across the interior between the settees, for stowage and as a battery location. The cabin roof has been lifted by 100mm (4") to give a bit more headroom. It also allows the cabin structure to give better protection to the cockpit from waves that may come on board when sailing hard. 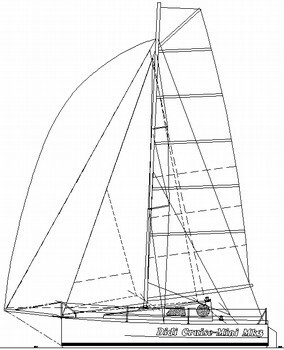 The rig is simplified and shorter but has the same foretriangle and uses the same headsails. The mast has swept spreaders for good support so that the running backstays are needed only when a spinnaker is set. The efficient square-top mainsail is smaller and easier to handle. The deck layout is a fairly conventional 3-winch arrangement. The smaller headsails sheet to the top of the cabin and are led to the cabintop winch. The larger headsails and spinnakers sheet to the cockpit winches. Tweeker lines replace headsail tracks. The lifting keel is also operated with the cabintop winch. Drawings for the Didi Cruise-Mini Mk3 include full size Mylar patterns of the backbone, bulbs, rudders and daggerboards. Optional full size Mylar patterns for the bulkheads are also available. Pre-cut kits will also be available from our normal kit suppliers. Click for material list or drawing list.